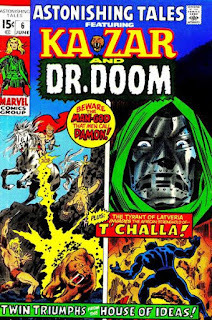 Back in the early 1970s, Marvel tried making Dr. Doom a protagonist by headlining him in the anthology title Astonishing Tales. He was originally given equal billing with Ka-Zar, although his cover space was reduced on #7 and reduced again on #8 before being dropped from the title altogether. But in his short stint as one of the book's headliners, he fought against none other than Black Panther for two issues. The plot is pretty simplistic. Doom decides he requires vibranium to build his "most perfect weapons" and he digs a tunnel from Latveria to Wakanda (something in the 3,000 mile range!) to just excavate it himself. In the process, he sets off volcanoes and earthquakes in Wakanda, alerting T'Challa to his presence. The two face off, Panther is briefly captured, but eventually gains the upper handing by threatening to destroy all of the vibranium rather than let Doom steal it. Doom leaves, wondering if he might someday ally himself with T'Challa. And then we have the characterization... every bit of it is awful on so many levels. First, Doom is portrayed as basically a two-bit thief. I mean, he's the monarch of an entire country; why not just, you know, buy the vibranium he needs? And then to be so careless with his excavations that they send shockwaves through the entire country? Black Panther is nominally better, mostly by virtue of being a hero, but he still threatens to destroy all of the country's vibranium and his people to keep Doom from getting it. As the story is written, it's not an empty threat either. I'm sure it's been since retconned as such, but T'Challa's thought balloons clearly indicate he's perfectly fine sacrificing his entire nation without a moment's hesitation. He also makes reference to his people recently being released from slavery, even though historically Wakanda was never conquered. You could argue he was talking about "people of color generally" or maybe "any people who've ever experienced slavery" but the dialogue seems pretty clearly written as if he were an American referring to enslaved Black people. But the worst offense here are the nameless Wakandans shown in some of the background pieces. As of 1971, when this book was written, Wakanda had been well established as having more and better technology than any other country on the planet. But every instance where Wakanda and/or its inhabitants are shown, we presented with stereotypical Hollywood-esque "Africans." (T'Challa even says, "The African brothers are in danger!") We see Wakandans in bare chests, grass skirts, and the like. Plus they harbor a HEAPING dose of tribal fear in the "wrath of the gods!" vein. That is literally part of the dialogue. The ostensibly most advanced nation on Earth is shown as a "Darkest Africa" backwater that makes the natives in the original King Kong look like they're the height of technological and social achievement. I don't know who should bear the brunt of the blame here. It doesn't really matter, though; it's a far cry from the characters and culture put forth only a few years earlier during Black Panther's debut. 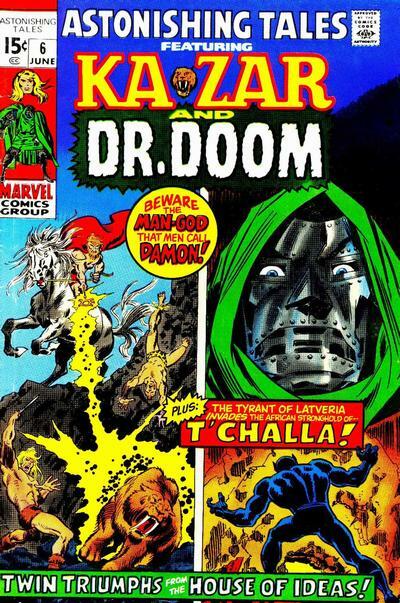 I haven't read every issue, but I got the sense that Roy Thomas and John Buscema tried to keep that in mind when they had T'Challa over in The Avengers -- I don't get that sense at all here. And given that Stan Lee oversaw all of it, I kind of think he never really understood the character in the first place. 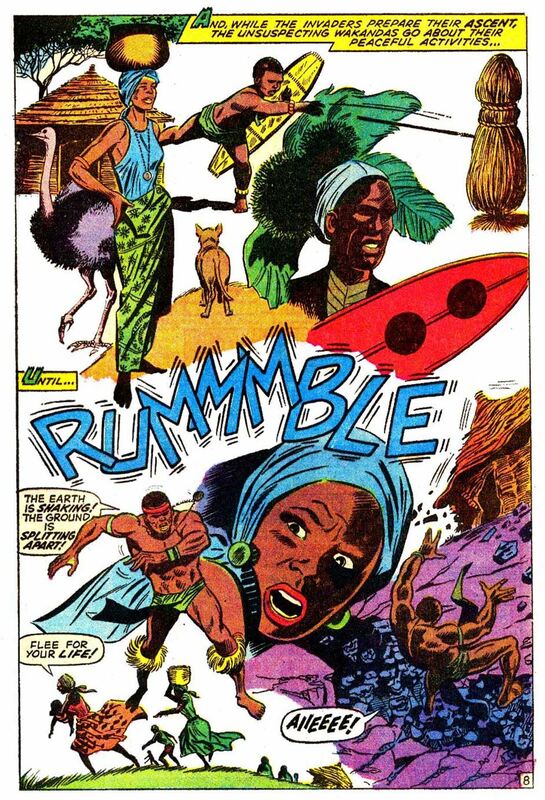 For even as wacky as Jack Kirby's 1977 Black Panther series was, he still treated all of the characters with respect, and didn't show them as barely literate tribal stereotypes. Not every writer or every artist is going to have the same take on any given character; that's to be expected. But writing an entire continent off as something barely above savages is a pretty ugly way to use any character, particularly those that have been expressly shown to be otherwise. Unless you're a completist of some kind, don't bother trying to track down these two issues.